Mohamed Salah may have scored the goal that will seal three points for Liverpool this afternoon against a solid Crystal Palace side after a bizarre stroke of luck. 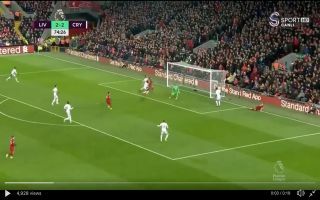 In the 75th minute of the clash, Liverpool midfielder Fabinho launched an inch-perfect ball upfield, James Milner slid the ball across the face of goal and Palace legend Julian Speroni produced a calamitous error by punching the ball behind his head, leaving Mohamed Salah free to tap into the back of the net. Liverpool have been handed an almighty gift by the Eagles this afternoon and Roy Hodgson’s men will be kicking themselves if they come away from this game with nothing. Salah has showed off his poacher’s instinct this afternoon by being in the right place at the right time. Salah couldn’t have found a better time to score his 50th Premier League goal, a win against their usual ‘bogey team’ could set them on the path to lifting the Premier League title.